Eva Solo Wine Rack Kit (P/N 567724). With our Eva Solo wine Rack Kit, you'll never make a mistake. Even with an odd corner space under the stairway, you can build and rebuild again and again. Turn that unused, cool, dark spot into your very own wine cellar. Materials allow you to make any shape. 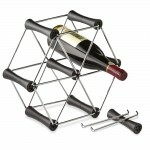 With these racks you can start small and add more kits as your wine collection grows. A carpenter once told me, "Measure twice, cut once."